P5P PLUS is a dietary supplement which contains pyridoxal-5-phosphate (P-5-P), metabolically active form of vitamin B6, which does not have to undergo initial transformations in the liver, in contrary to other forms. Vitamin B6 in form of a coenzyme is quickly absorbed by the body system, and the presence of vitamin B2 and magnesium increases bioavailability and enhances preparation action. Vitamin B6 is one of 8 B-vitamins which is involved in many enzymatic reactions, including metabolic processes. It supports transformations of proteins, fats and carbohydrates, participates in gluconeogenesis and glycogenolysis as well as promotes the proper use of energy obtained from food. Pyridoxine is also responsible for the development of the nervous system and the proper functioning of the cardiovascular system. Vitamin B6 naturally occurs in various food products, especially in livers, fishes, cereals, nuts, yeast and egg yolks. Increased demand for the vitamin is observed in people with impaired kidney functions (patients on dialysis, after kidney transplantation), autoimmune diseases (Crohn’s disease, ulcerative colitis, coeliac disease and rheumatoid arthritis), using particular drugs (e.g. isoniazid, penicillamine and oral contraceptives) and alcoholics. Symptoms of vitamin B6 deficiency include mainly dermatological lesions – pruritus, rash, cracking corners of the mouth and inflammation of tongue mucous membrane. Other symptoms are muscle weakness, depressive symptoms, concentration problems, temporary memory loss, weak immunity and irritation. Possible are also very sensitive hearing and anaemia caused by impaired haem synthesis. Vitamin B6, together with folic acid and vitamin B12, affects reduction in homocysteine level, which is an amino acid whose high level is one of the risk factors of cardiovascular diseases. Moreover, it is a coenzyme for an enzyme involved in haem synthesis, which is 5-aminolevulinic acid synthase, which is why it supports haemoglobin production and its ability to bind with oxygen. Vitamin B6 is essential for the proper functioning and development of the brain, prevents premature nervous cells ageing and participates in neurotransmitters biosynthesis (serotonin and dopamine), so that it improves mood and cognitive skills. Its deficiency results in neurological disorders, which are caused by i.a. improper synthesis of catecholamines, decline in gamma-aminobutyric acid (GABA) and impaired composition of amino acids in particular brain areas. It was demonstrated that higher level of pyridoxine in blood in elderly people promotes memory improvement. Some scientific studies demonstrated that vitamin B6 can be beneficial in case of premenstrual syndrome (PMS). The vitamin can reduce such symptoms as irritation, mood swings, anxiety and bloating. Vitamin B6 determines the proper functioning of the immune system. It is involved in production of antibodies, lymphocytes and IL-2. Moreover, many key enzymatic reactions depend on the presence of the coenzymatic form of vitamin B6. Vitamin deficiencies weaken defence mechanisms of the body system and increases vulnerability to infections. Vitamin B6 can relieve morning sickness associated with pregnancy (and not only). However, you should consult your doctor. 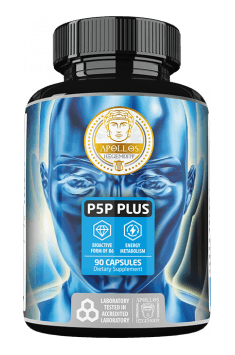 To sum it all up, P5P PLUS is a dietary supplement of wide spectrum of applications. Basic indications for use are deficiencies of vitamin B6. Moreover, it improves circulatory system and immunity as well as can be useful in case of PMS and pregnancy nausea. Benefits from preparation use in case of cognitive skills improvements make it usefuls for pupils, students and white collar workers as well as for people with depression and sleeping disorders.